In The game you need to assemble a motorcycle as maybe you have thought a lot of times in your dreams, and then you have to drive it to start your racing champion adventure. The best part of the game is that you need to assemble a motorcycle that you like and this could give a lot of game players many choices. 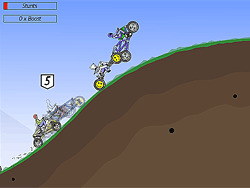 And in the process you can accelerate to the top speed when you are driving in the rugged road, on the way you can also use the space bar to jet for your motorcycles. You need to complete all the levels in order to win the championship, only after you play it, you will know the great fun of it. You can play Dream Car Racing 2 free online car games at fogames. It has tags: Driving,Kids,Simulation,Racing,Car,Series,Collecting,Stunts,. It has 8597 total plays and has been rated 93.5% (70 like and 8 dislike), find the fun and happy day. If you want to play more car games, we find some of the game: Dream Car Racing 2, A Kitty Dream, Ice Cream Racing and Platform Racing. To play other games, go to the driving games page, the kids games page, or just check out the new games or best games page. Play Dream Car Racing 2 online games, Fun and Happy.